The first short film I ever made was a comedy about lawn gnomes that came to life and trapped three unsuspecting college students in their house. 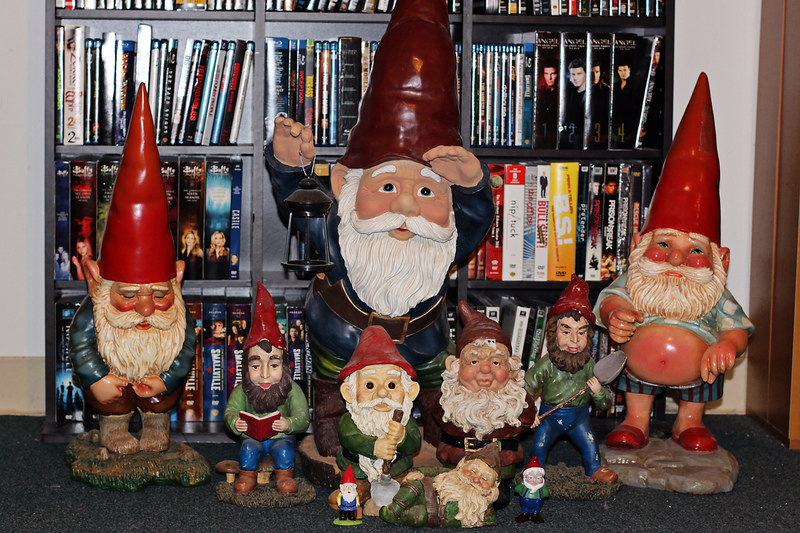 The final cut was lost a few years back when my hard drive got wiped (which in some ways may not be a wholly bad thing), but it was a fun shoot and cemented my love of all things gnome-related. Since then, my family & friends have helped me to amass a small collection. Upon the release of Gnomeo & Juliet, an adaptation of Shakespeare’s play using lawn gnomes, the gnomes have informed me that if I do not go to see it, it will be a betrayal of everything I stand for. And there’s more of them than there are of me, so I’m inclined to listen. It’s been two weeks since I’ve updated this, but it’s been a busy two weeks. I had my audition for the Atlanta Unifieds this past Tuesday, and was very happy with how it went. Also, I finished filming Home Sweet Home last Saturday, which was a week later than I had originally planned because of complications that arose, but I’ve learned to expect problems by this point (since they’ve come up in every single film project I’ve ever attempted.) Then on the last night of shooting, there was an interesting moment where I was filming a scene outside the Trade Center that involved an actress screaming bloody murder, and a police car pulled up to ask me some questions. All things considered, though, I was really glad it was the police, because the alternative probably wouldn’t have been good at all. Now that April is here, it’s time for me to really get to work. I have to get Home Sweet Home edited fairly soon so I can get it to Sean & Will so they can work on the sound & color correction respectively. I also have to finish editing The Dark Side of Sun Rock; I have a self-imposed deadline for that being completed by the beginning of May so I can get it into a few festivals, but more urgently I need to get a few clips from it to my lead actress for her reel. There are a couple of scenes in it that are still driving me berserk because of continuity problems or lack of good coverage which I’m still trying to find solutions for, and which may result in me headdesking until something comes to me. The other thing I’ve got going on in April is Script Frenzy, the younger cousin of NaNoWriMo. For anyone unfamiliar, NaNoWriMo is a writing event in November where the goal is to write a 50,000 word novel in one month. Script Frenzy is similar, except instead of a novel, the goal is to write a 100 page script in one month. I’ve been looking forward to this since I found out about it a few weeks ago, and set aside one of the screenplays I’d been developing until April for this. It’s entitled Once Bit, and it’s my take on the vampire genre. I’m really excited about it, and can’t wait to see how it turns out. If you’re interested in undertaking this challenge as well, let me know so I can have other people to commiserate with. My user ID on the site is IcyBrian.